The “Evening of Missions” was held on Saturday, February 13, in the Hall of John Paul II in Medjugorje. There were many interested supporters who came for this event and documentary movie about 40 years of the Franciscan School Sisters in Kongo was presented, titled: “Franciscan School Sisters in the heart of Africa”. 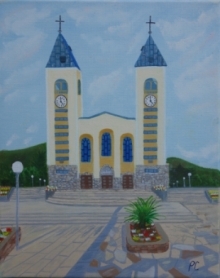 During January and February there are less pilgrims in Medjugorje and it became tradition to have spiritual renewals in this period. This coming weekend the spiritual renewal will be held from February 19-21, and Fr. Ciril Cus from Slovenia will conduct it. Each Lent we meditate on the passion of Christ, especially in devotion of the Way of the Cross, that we as faithful say in our families and in the churches. January and February are months that are a bit different than the rest of the year.